Click to see the rest of my photo set. Ah, Portland. It is rare that two great beer cities the likes of Seattle & Portland exist within such a short distance of each other, and I try to make it down to Beervana as much as possible. On a trip a couple weekends ago, Jeanne and I took the 5:30pm Amtrak train (now with free wifi) south on Friday and were in at the PDX station by 9pm. We snagged a cheap room at the Hotel Monaco using Priceline, and after checking in it was off to grab beers at our two favorite spots within easy walking range from downtown hotels. First up was drinks and dinner at the Deschutes Portland Pub. Deschutes is one of my favorite breweries in existence, and visiting the PDX pub is always a pleasure. This time around I had a pint of what just might be my perfect cask beer, Red Chair Northwest Pale Ale. This beer really shines on cask, and I could have easily sat there downing a few pints of it with a smile on my face. I also sampled the 31-25 Hef, which is a hoppy wheat beer, as well as a taste of the Hugh Hefner’s Jacket, a lightly smoked helles lager. Jeanne tried the Armory XPA after a glass of Hop Henge. All of the specialty beers we tried were impressive, which is one of my favorite parts of visiting the pub. The highlight of dinner was the house-made pretzel we had as an appetizer; good enough to rival any we’ve ever had. It was getting late by the time we finished dinner and a few pints, but we walked down to Bailey’s Taproom just in time for last call. With their focus on getting the best from all around Oregon, there were at least 12 beers on tap that I have never tried. I went with the 4.8% ABV Oakshire Black Wolf, which was a perfectly-made Schwarzbier that made me feel like I’d won the beer lottery. 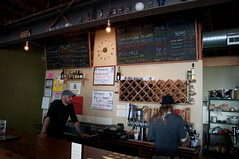 Jeanne had the Boneyard RPM IPA, which was a solid example from the Bend, Ore brewery. This guy's happy to have his Pine State after a long wait. The next morning, it was time for the real beer exploration to begin. 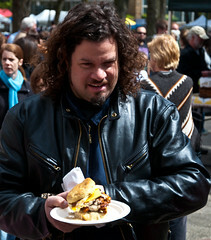 But, not until after finally trying the famous Pine State Biscuits at the Portland State Farmers Market. After the 30-minute wait in line, we snagged some fried chicken breakfast biscuit sandwiches that lived up to their reputation. Now that we had our stomachs lined for the day ahead, it was off to the Eastside to kick things off. The northeast and southeast neighborhoods of Portland are divided by Burnside Avenue running east to west, and most of our walk for the day was right around that dividing area. 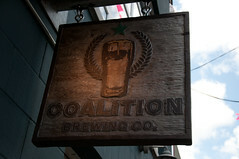 We hopped on the #20 bus and headed to our first stop, Coalition Brewing. Barely open for a year I believe, Coalition is located on a quiet street just off of Burnside and NE 28th St. The pub had just opened for the day, and as we pulled up our barstools we were happy to order up a tasting flight of all their current beers. Everything was pretty solid, with my favorites being the King Kitty Red, the black IPA-like Hanso Stout, and the Loving Cup Maple Porter. Coalition’s love of hops was evident, as five of the eight beers we sampled had an IBU count of over 50+, with the IPA and stout both above 70. The space was small, but comfortable. The staff was friendly and talkative, and we spoke to co-owner Kiley Hoyt for a bit about the brewery and their Coalator Program, which is a program where local homebrewers get to brew up a batch of their beer on the Coalition pilot system to serve at the pub. After a 1/2 mile walk north up 28th, with a stop at Alma Chocolate to get some treats, we arrived at Migration Brewing, located just east of 28th St. on Glisan St. Lucky for us, the sun was shining and Migration has a fairly expansive patio with picnic tables. After purchasing a taster tray inside, we grabbed ourselves a table in the sun and got down to business. The sessionable Migration Pale Ale was the star for me, while Jeanne’s favorite was the Luscious Lupulin IPA. Both were good enough to warrant purchasing a full glass after we were done with the tasters. Terry’s Porter was also impressive, and the nitro version we sampled was brewed with mint, giving it a nice twist. The one miss for me was the Old Silenus Amber, which is most definitely not your typical amber. I’m not sure what it is, but I didn’t enjoy it. One miss certainly didn’t put a damper on our visit, and I’ll gladly be back at some point in the future. Make sure to come back later this week to check out Part 2, with visits to East Burn, Burnside Brewing, Cascade Barrel House, and Apex.